After being a big part of Funko's Despicable Me Mystery Minis, those cute little Minions are getting a line of collectible figures to call their own. 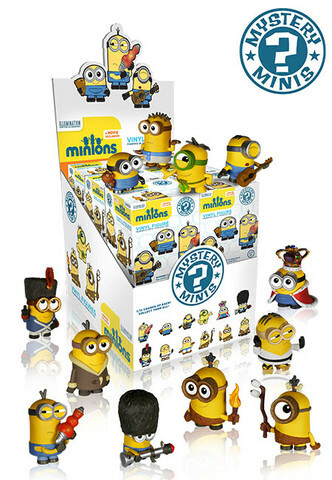 Based on the spinoff film, the 2015 Funko Minions Mystery Minis are a series of small blind box figures. The set has 12 different characters, encompassing different Minions throughout history as shown in the animated feature. Some are dancing and most are holding accessories. More importantly, despite a somewhat generic look for the Minions as a whole, each one of the Mystery Minis is significantly different from the rest. Like all Mystery Minis, they're packaged so that you don't know what the figure is until both the box and the bag inside are opened. Unlike a lot of Mystery Minis, all are made in equal quantities. Each mini figure has a 1:12 rarity. 2015 Funko Minions Mystery Minis come with 12 boxes per case. Each box has one figure. Funko Mystery Mini Minions Movie Karate Minion 2"